UPDATED to include a quick note about 24hrBikeShop. In our travels, we’ve eaten at numerous restaurants, visited museums, and stayed at a variety of accommodations (from campgrounds and homestays, to hostels, motels and the occasional hotel). One of the first things we key in on is the relative bike-friendliness of any establishment. Being in Portland the last few months, we’ve been spoiled with the amount of bicycle accommodations local businesses have to offer – bars with indoor bike parking, streets with bike corrals, etc. We completely understand that many establishments in other parts of the country don’t have the resources or manpower to devote to turn their business into a full blown Portland experience. However, there are many relatively easy and inexpensive ways to lure cyclists in and have them talk about the bikeyness of your business. 5. Have a basic flat repair kit / pump handy. As bike tourists, one of our most common expendables is tubes and tires. Flats are generally a small nagging problem in the city, but can transform into a big problem when you are in a small town in the middle of nowhere. We’ve been to areas with nary a bike shop for days. If you’re a business in a small town, one easy thing to do is carry a basic patch kit for cyclists. If you want to go a little further, consider a handful of spare tubes in varying sizes. If you want to really get a cyclists attention, get a floor pump. I was having coffee at Cellar Door in Portland a few days ago and noticed they had very non-chalantly placed a floor pump in the corner. I didn’t have to use it, nor did I see anyone else use it, but the fact that it was there stuck in my head. It said to me, “we’re going to invest a little money to make this place friendlier for cyclists.” They probably didn’t intend the floor pump to be a clever viral marketing campaign (or maybe they did), but since seeing it I’ve told my friends about Cellar Door and now I’m telling you. In the small town of Saxapahaw in North Carolina, we passed a great little general store with an amazing bakery that was a good ride from the closest town with a bike shop. It happened to be a popular stop with roadies from Chapel Hill and Carborro. In order to help out the cyclists that were stopping by every weekend for breakfast, they had an ingenious thing called a BikeBox! Think of it as an all-in-one “starter kit” to be a bike friendly business. It contained tubes, patches, energy gels, etc., You can even customize the contents of the box to better match the type of cyclists riding pass your town. If you have a BikeBox it also gets listed on their website. These would be perfect for those tiny towns along Adventure Cycling routes without bike shops that want to help out cyclists! 4. Have some maps handy. Next to tubes and beer, the lifeblood of touring cyclists is a good map. If you are in a town that is fortunate enough to have an official bike map, keep one handy. Even if you don’t have one, but there is a strong cycling community, ask them to compile some great riding routes and create a DIY bike guide. If you are a hotel or motel that sees a lot of traveling cyclists pass through, there is a good chance you might be on an Adventure Cycling Association route. If you totally want to blow the mind of a touring cyclist, ask them if they need the next section of map for their route. It will no doubt stun them into a state of eternal gratitude. 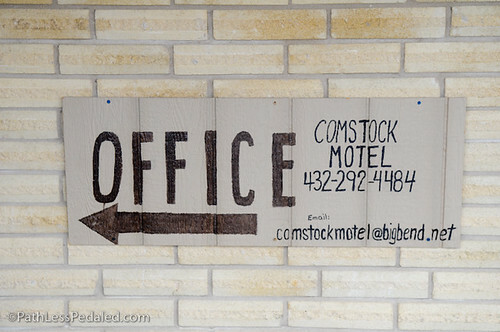 We had this experience in Comstock, Texas. Comstock is essentially a street with a handful of buildings. By the time we got there, we were out of food and beat up after battling headwinds the last three days. We had heard about a motel but could find no listing on Google Maps. Sure enough, it was there, and we were grateful. What totally blew us away was how friendly the couple was that owned it. 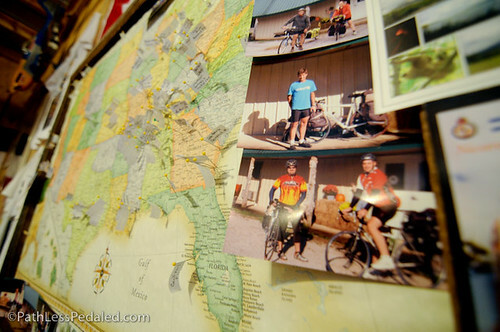 They recently purchased the property and welcomed touring cyclists with open arms. They even had some Adventure Cycling materials in the lobby! When we arrived, all the markets were closed and had no food left. One of the workers at the lobby ended up driving home and made us some microwave popcorn to tide us over until the next day. We rode 10,000 miles around the US with no U-lock. We still remember telling this to folks at our presentation in Brooklyn and everyone in the room flipped out and immediately tweeted it! What we’ve discovered is that, about 95% of the time, your bike will be fine. Out in the middle of the country, we’ve had no problems. Our only time of concern is in big cities. If you have a bike shop or run a motel and see a good number of bike tourists, offer them a u-lock to use for their stay. We usually spend a day or two in big cities to explore and bolster the local economy. By offering a cyclist a u-lock, they are more apt to feel comfortable riding around town to eat at a restaurant, buy some coffee or buy something from your shop or stay in your motel. Another possibility is to offer a cyclist a secure backroom where they can leave their bike while they explore. Laura recently met some friends at a the Doubletree hotel bar and the concierge checked her Brompton in the secure luggage check. It was a simple act, it didn’t cost them any money to do that and now we’ve just told thousands of people. There is nothing more irksome than checking in somewhere after a long day of riding and then being told that we can’t bring our bikes into the room, but “there is a perfectly safe place to lock them in the back of the building by the dumpster.” No thanks. For the touring cyclist, the bike is everything. There is no bicycle touring without the bicycle. 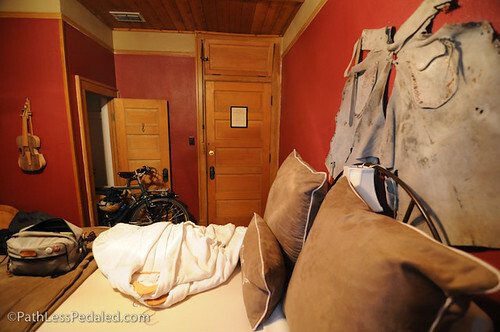 If you run a place with sleeping accommodations, know that a bike tourist will feel more comfortable with the bike in the room with them. We understand that you’re worried about the carpet and floors, but they don’t do any more harm than a wheelchair or a stroller. You wouldn’t ask someone in a wheelchair to park their chair behind the dumpster would you? Ironically, some of the nicest places we’ve stayed have allowed us to bring our bikes into the room while some of the dumpier sticky carpet motels have scoffed at the notion. Some notable examples were the El Capitan in Van Horn, TX; the Hotel Paisano in Marfa; and The Gage in Marathon, TX. 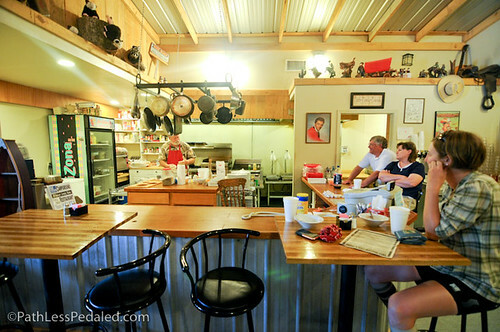 You’ll notice that the three places we mentioned are out in far west Texas, perhaps the last place you would expect hospitality for the touring cyclist. However, each of these establishments were highly hospitable and let us have our bikes in the room. The El Capitan in Van Horn (on the path of the ACA Southern Tier route) even had an oversized elevator that made it possible to fit two fully loaded LHTs at once. As a business, you could do one of these things, all of these things or none of these things. Regardless of what you choose, having the right attitude is the most important. Bicycle tourists, admittedly, are a strange lot. We are modern wayward travelers, looking for meaning, adventure and fun, who choose to do it by bicycle, just as others may choose an RV, motorcycle or car. Because we are constantly out in the elements, alternating between sweating and stuffing our faces full of food, we are eternally grateful for the small niceties that businesses and small towns may offer us. We remember acts of kindness and spread the word. Bicycle tourists and cyclists, in general, are an extremely wired and connected community. News travels fast. 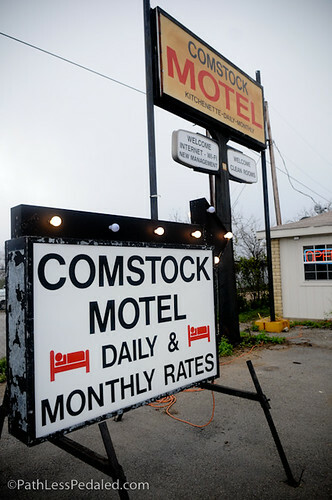 That motel we mentioned in Comstock? We heard about it days in advance through word of mouth from passing cyclists (now we’ve broadcast it to a wider audience). If you welcome us with open arms, we’ll tell everyone we know. One of the most standout experiences we had was at a small private campground in Tennessee, off of the Natchez Trace, called Fall Hollow. It was a long day of hills and we pulled in, tired and famished. The place looked deserted but we stuck our heads into the campground office and restaurant. The two owners were getting ready for the evening shift. All the food was still put away and none of the burners were on. They saw us and started chatting us up. They offered us some hamburgers (my Kryptonite) even though they weren’t officially open. To someone half-deranged from baking in the sun and famished from going up and down hills all day, it was a godsend and it was one of the most beautiful and perfect hamburgers of my entire life. They didn’t have to do anything for us. They could have told us they there were going to open in three hours and just have us wait. But they saw us as fellow humans, not freaks on a bike, and made a connection. Few thoughts about hamburgers bring tears to my eyes. Yet, when we look back at the kind hosts at Fall Hollow, who fed us when the kitchen was closed, it’s hard not to get a warm and fuzzy feeling inside. Becoming a bicycle-friendly business doesn’t have to require a lot of money. Often it takes only small actions and a little understanding to help out a touring cyclist. These small accommodations often go a long way and spread quickly in bikey circles. If you’re excited for our Big Adventure. Small Wheels. trip and support our goal to invigorate bike and train travel, consider making a donation to allow us to go further and create inspiring videos along the way. Hey, love your blog and now that you’re in Portland, would love to buy you a coffee! I have a friend in town who turned me on to your site who’d probably pay for it. Glad to hear you’re enjoying your PDX experience. Your #2 is so true! In 1990, when I was 14, my dad and I rode our bikes from central Ohio to Manitoulin Island, Canada. On the second night, we stayed in a hole-in-the-wall motel that gave us trouble about keeping our bikes in the room (we ignored them). The next night, we stayed at the Best Western Wheels Resort in Chatham, Ontario. We checked in, without a reservation, hot and sweaty, and were told that of course the bikes could stay in our room and that housekeeping would bring us something to put on the floor. A housekeeper met us with some sheets as we arrived at our room, and I still remember the name of the hotel, 21 years later. Finding bike-friendly accomodation is a piece of cake for cyclists that have joined ‘Vrienden op de Fiets’. This organisation brings individuals and families together who like to host touring cyclists. They’re over 4000 but mostly in Europe, and more precisely in the Low Countries (Belgium and the Netherlands). In the meantime, the first families in the US and Canada have joined. It’s not for free, but what you pay is a fair price based on the cost of your stay including breakfast. These are great tips. Hospitality goes a long way, regardless of whether it’s to a pair of bicycle tourists, or a simple messenger looking for a safe place to rest their bike for 5 minutes. I rolled into a hotel for a business meeting last fall, and the staff tripped over each other to offer to secure the bike. It was a great experience. I can say about #5, even some bike shops could use to look at that. Blew a tire out riding around a new city, saw a bike shop asked about getting the flat fixed and the would only sell me a tube(not even the correct size for my bike), didn’t have my repair kit with me as it was all in my hotel room. They said their tech was not in the shop so they could not do it. 5.5 mile walk back to my hotel. Guess that also goes along with #1. Though it should be self-evident, tip #1 should be: install a bike-rack, so that cyclists have a place to lock their bikes, while spending money at your establishment. Overnight, I wouldn’t keep my bike locked to a rack, but, for a quick jaunt into the grocery store, cafe, etc. I’d really like to be able to lock my bike to something. Great article! I’m sure a lot of businesses will find this helpful and reap the benefits! Way to go you 2! Would like to know if there is somewhere that a business can get themselves listed as a bicycle friendly business. Is there an organization that is keeping a list that would allow us cyclists to go on line and check for the area that we were in and see if there was someone that has listed some of the things that they offer for cyclists? It might be a good and worthwhile thing to do if nobody has started it. Thanks always for a great article and great ideas. I’ve been stashing floor pumps at businesses for cyclists to use and now businesses are asking for them. An idea that I got from your blog. Thank you for sharing and writing your blog. I hope to see you in Charlotte, NC sometime soon. On my bike tours I’ve never really felt the need to lock up with a heavy duty lock except in a larger city – and I don’t even own a u-lock. I’ve never come across a motel I stayed at that would not permit me to bring my bike in. One in Cumberland Md even was so generous that they had a bike wash for guests. I’ve also had quite a few campgrounds with bike rates that made it difficult NOT to spend a number of days there relaxing and exploring. Especially some of the ones that really went above and beyond – one driving me in to town for groceries because it was storming by the time I got there. Toured across the country in 2012 from Bar Harbor, ME to Anacortes, WA. Mixed it up with camping and hotel/motel accommodations. Every hotel gave me a safe place to store my bike except for a hostel in Niagra Falls, NY. One of the most memorable places was in Wauconda, WA. I had just ridden over Sherman Pass from Kettle Falls into Republic to find the campgrounds and hotels all full. I pressed on over the Wauconda Pass and stopped at a closed Cafe. The owner was inside and although closed and not a camping spot let me set up my tent out back and cooked me dinner. Thanks Maddie! I love this blog and look forward to utilizing every single suggestion in our Bed and Breakfast. We hope it will bring in a lot of byclists to our establishment. Thank You for the tips! You are so right about some of the better motels allowing you to keep the bike in the room, compared to some of the lower quality motels not letting you. This was my experience, cycling from Sydney to Melbourne last year.